An RV can provide you with a ton of fun and take you on adventures that you otherwise would not be able to go on. However, an RV takes up a lot of space and you need somewhere to keep it when it is not in use. Fortunately, RV storage does exist and is an excellent way for you to make sure your RV is safe while you are away or throughout the winter. Below, we will discuss what RV storage is, what you can expect when you do store your RV and answer some questions you may have about RV storage. Whether you have a small or large RV, you will find that parking it in front of your home is ideal when you use it throughout the summer months, but, as winter approaches, it is exposed to the harsh elements of winter and starts to become an eyesore because typically you cover it with tarp or takes up your lawn space. So, what can you do when your RV is in need of a place to stay? RV storage is the answer. But what is RV storage? It is a safe place for you to park your RV when you are not using it. Since an RV is anywhere from 18 up to 25 feet and it can weigh thousands of pounds, it is no easy beast to store. RV storage is very specific, and it meets your storage needs. Most individuals seek out RV storage for their motorhome because they just do not have the means or ability to keep it on their property. When you think about it, most homes do not have the space and if they do, you must give up that lush landscape or driveway space to keep it there. While you may need RV storage out of necessity, there are many benefits to choosing it over other options. First and foremost, you will find that storage facilities are much more secure than even your yard. This is because most, if not all, RV storage facilities are well lit, they are fenced in, require an access code to enter, and they are monitored by video and audio surveillance. Many of the 24-hour access facilities have a security team or manager that lives on site to ensure your RV is always protected and safe. Another benefit of RV storage is that they can provide you with protection for your RV that you would not otherwise be able to provide. Covered outdoor parking spots and indoor units can offer you superior protection and you would not get this at home as an RV does not fit into a garage. 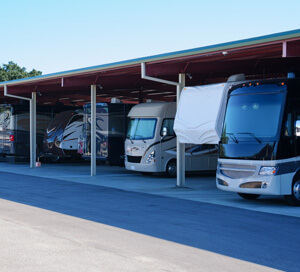 Renting a covered parking spot or indoor storage unit for your RV will save you money on repairs that are caused from being left outside in the elements. Some facilities do offer 24-hour access to your unit, which means you can head out to your RV any time and gather any items you may need. Some of the other amenities you may enjoy including wash stations for the RV and electrical hook ups. When you think of storage, you often think of a garage-like area where you store items you do not have room for. When it comes to RV storage, there are four main types to include: covered RV storage, indoor trailer storage units, RV land lots, and RV parking spaces. While there are many options, both RV land lots and RV parking spaces are the most popular and the most plentiful. While they are common, they come with the least number of perks and are generally much cheaper than the other two options. Covered and indoor units are more expensive, and they come with perks that can help provide you with a better storage experience, but they are harder to come by. When it comes time to choose a type of storage, you want to keep in mind the price, the size, and the location. Below, we will discuss each type of RV storage option in a bit more detail to help you better understand what to expect. If you want some protection for your RV while it is being stored, you may want to choose a covered RV storage option. This option will keep your RV out of the weather and there are two main types of covered options, which include a standalone canopy or a three-sided walled canopy. Both covered options provide some protection to your RV; however, the three-sided walled option provides the most protection. An indoor trailer storage option is the most expensive out of all options and it is like the typical self-storage unit you think of when you think of a storage unit. These units are like a large garage and they have a large roll-up door that allows you access in and out. Typically, these units are about 30 to 50 feet in length, about 15 feet tall, and 12 to 15 feet in width. This type of unit is ideal for individuals who want superior protection for their RV and the peace of mind that the RV is behind four walls and a lock. The most readily available and basic type of RV storage is an RV land lot. This type of storage is available at most facilities that also offer car storage options. They are the least expensive out of your options as well. This type of RV storage is an unpaved lot or land that is leased to RV owners. Once you lease a spot, you park your RV out on the lot and it remains there if you pay the rent and until you come back to get the RV. While your RV is parked within the confines of the facility and typically there is a fence that surrounds the lot, your RV is not protected from the elements and you may need to purchase a cover for it. Often, this is a good option for individuals who need to simply get their RV off their property and park it somewhere. RV parking spaces are the second most common type of RV storage and you can typically find these at any storage facility, especially if they offer car storage. When you rent one of these parking spots, you receive a designated paved spot where you park your RV. You may find that there is a specific area where only RVs are parked, or the facility may just have parking spots around the building where you can park the RV. Just like the open lot option above, your RV will be exposed to the elements and you may want to purchase a cover to protect the RV. This is another good option for individuals who need to keep their RV parked somewhere. Above, we covered the types of RV storage options available. Once you have decided on the type of storage you want, you will need to consider the size that your RV requires. You do have several options, which we will cover below. A 25-foot RV storage space sounds like a lot of room but it is not when you think about the actual size of an RV. This type of storage space will accommodate a Class B or Class C campers, toy trailers, travel trailers, and pop-up trailers/campers. You may find that you can fit these types of RVs into a 10x25 storage unit too. A 30-foot RV storage space can handle a bit bigger of a camper than the previous 25-foot space. You can expect to park a small or medium B class camper, large pop-up trailers/campers, travel trailers, fifth-wheels, and small Class C campers. While you can find 10x30 storage units, they are unfortunately too short in most cases to handle any of these RVs. A 35-foot RV storage space can handle larger RVs than the two previous options. You can expect to keep a large Class B or Class C camper in them, medium to large travel trailers, large toy trailers, small to medium fifth-wheels, and small A Class campers. A 40-foot RV storage space can accommodate all RVs except for the largest ones on the market. This means that pretty much any RV, trailer, or camper you have will fit into this size space or unit. You can expect to store almost all A Class campers, fifth-wheels, and large travel trailers inside. A 50-foot RV storage space can handle the largest of any RV. In fact, you would be hard pressed to find an RV, trailer, or camper that does NOT fit into this space or unit. From destination trailers to large fifth-wheels and all Class A campers, there is nothing that will not fit inside. You may naturally worry about the safety of your RV while it is being stored. It happens to the best of us and you are not alone. 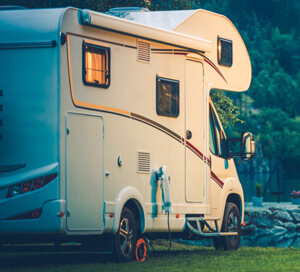 Before you do decide to rent out a space or unit at your local RV storage facility, take a moment to check and see if your current RV’s insurance policy covers any damage, theft, or liability while the RV is stored. If your RV insurance policy does not, then you may want to secure a policy that does. Protecting your investment will provide you with that extra peace of mind you are after. Before you can store your RV, you need to first prepare it and maintain it. If you do not, your RV can suffer damage and it may not work properly when it comes time to drive it off onto your next adventure. Below, we will discuss the steps you should take to prepare your RV for storage. Of course, these steps should only be taken if you plan to store your RV for an extended period as it would not make any sense to do all these steps to simply take your RV out the next week. Step #1: Clean your RV. Just as you would a boat or car, you want to clean the RV, which means washing it and drying it thoroughly. 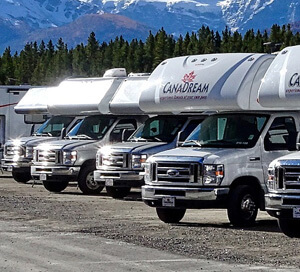 If your RV is too big to care for on your own, you should hire someone to clean it for you or take it to an RV wash to have the cleaning performed. Step #2: Unplug your electrical components including the battery. You should unplug all electrical components that may be plugged in within your RV. For example, you would want to unplug the TV, refrigerator, alarm clocks, and so on as they will drain the battery if left plugged in. You also want to make sure you disconnect and remove the battery, especially in the winter or when you plan to store the RV for an extended time. You can purchase a trickle battery charger to help keep the charge in your battery too. Step #3: Make sure the pipes are dried out. This is an especially important step if you plan to store your RV over the winter because moisture or water left in the pipes can freeze and then cause the pipes to burst. You will need to dry out all the pipes and, when possible, pour antifreeze into the system and pipes to prevent any freezing issues. Step #4: Prepare the engine and fuel tank. Now it is time to take care of the engine in your RV. You want to top off all fluids and add antifreeze to the radiator. As you top off your fluids, make sure to top off the fuel tank too and add a fuel stabilizer to prevent the fuel from going bad. Step #5: Fill up your tires to max level. If your RV will rest in the same position for a long period, you may find that there are soft or flat spots on the tires when you return. This happens a lot and cold weather can make it happen quickly. You should add air to your tires to inflate them to their max level. If you will be in town and around, you should rotate the tires every few weeks to keep them in good condition. If you will not be around or you plan to store the RV for longer than a few months, you may want to remove the tires and store them on their side. Step #6: Prepare the RV for outdoor storage. Outdoor storage is one of the most popular RV storage options. Should you be storing the RV indoors, you can stop after step five. If you plan to store the RV outdoors, you will need to check the roof for leaks and make any repairs or add a sealant if there is a leak. Lastly, you will need to purchase a high-quality cover for your RV and place it over to protect it. Below, you will find some of the most commonly asked and answered questions about RV storage. Is there any type of minimum rental term that I must meet? The minimum rental term at most RV storage facilities is one month, which is the month you pay for. If you only want to rent for one month or a couple months, simply keep your lease paid current and then move out prior to the next due date for your lease term. Do check with the RV storage facility first though to check their policies and ensure you do not need to give a notice prior to ending your lease on your unit. What type of amenities do RV storage facilities offer? Since all RV storage facilities are different, there is no way to tell you exactly what amenities each one will have. 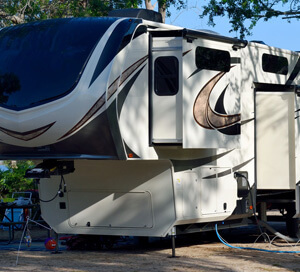 However, some of the most commonly found amenities at RV storage facilities include proper and adequate lighting, air compressors on site, wash and dump stations, and electrical outlets. What type of RV or large sized vehicle can I store at a storage facility? RV storage facilities are designed to handle the largest possible RVs, trailers, campers, motorhomes, fifth-wheels, travel trailers, destination trailers, and more. Will my RV be safe while at a storage unit? The answer in short is yes. Of course, anything can happen and is usually why the storage facility does require an insurance policy to protect your RV. When you choose a facility to store your RV, make sure you are not only comfortable with the facility, but that you verify the facility has a fence, gated access, and surveillance. Can I live in my RV while it is parked at a storage facility? No. You cannot live in your RV while it is parked at a storage facility. Storing your RV allows you to keep it off your property and in a safe place while it is not in use. Most facilities will require you to sign a form that states you will abide by their policies and this includes NOT living in the RV while it is being stored. It is not always easy to find a storage facility that accepts RVs for storage. In fact, you may need to do a bit of hunting, but, with the plethora of self-storage facilities around, you will likely find what you are looking for, even if it is a little bit of a drive. To help you find RV storage nearby, you should perform a search online or using the search bar below. Pair RV storage with your zip code or location and you will find that several results pop up. As you hunt for the perfect RV storage facility, take some time to inspect and tour the facility and make sure it meets your every need and fits into your budget.